In recent years, the waters of the Mediterranean have become an unmarked grave for a myriad of migrants who drowned during their desperate attempt to reach Europe by boat. Urgent steps are needed to stop this humanitarian crisis. Addressing the root causes, including poverty and civil war, which force or prompt people to attempt the dangerous journey is crucial but time-intensive. In the short term, European governments need to reverse their current policies and either substantially increase their own Search and Rescue (SAR) efforts or facilitate the operations of NGOs engaged in saving people at sea. For migrants, the journey across the Mediterranean by boat is perilous. Relying on the services of people smugglers, many attempt the crossing in small, crammed boats that are often unsuitable for such journeys. In 2014 an estimated 3,283 migrants, including refugees and asylum-seekers, died in these waters, with the death toll increasing to 3,782 in 2015 and 5,143 in 20161. Even though the number of deaths has declined to 3,139 in 2017 and 2,297 in 2018, because the overall number of people crossing the Mediterranean has decreased, the voyage itself has become more dangerous2. Indeed, the number of deaths per number of people trying to cross by boat has risen sharply. On the route from Libya to Europe, for example, one death for every 38 arrivals was recorded in 2017, rising to one for every 14 arrivals the following year3. The obligation to rescue people in distress at sea is embedded in international maritime law treaties, including the United Nations Convention on the Law of the Sea (UNCLOS), the International Convention for the Safety of Life at Sea (SOLAS) and the International Convention on Maritime Search and Rescue Search. Government responses to this crisis were, however, slow and limited. Noteworthy are the efforts of the Italian Navy which began SAR missions as early as 2004 with the objective to save lives at sea. After the sinking of two migrant vessels in October 2013, which left more than 600 people dead, Italy launched operation Mare Nostrum to intensify its SAR operations. Despite the international outcry that followed the October 2013 tragedies, European countries did not sufficiently support Mare Nostrum, resulting in its termination after only one year. Its successor, Triton (and subsequently Triton II), was headed by Frontex, the European Border and Coast Guard Agency, and no longer focused on SAR operations but on the fight against people smugglers and the protection of Europe’s borders in the Central Mediterranean. In the Aegean, a second Frontex operation named Poseidon was launched with similar aims in response to the increasing number of migrants attempting to reach Greece. As the death toll of migrants rose, Triton was in 2015 supported by EUNAVOR Med Sophia, with similar objectives, and other, smaller measures initiated by individual governments and international institutions such as NATO4. Despite the focus of these initiatives on the fight against people smugglers, they have nonetheless played an important role in the rescue of migrants. As part of EUNAVOR Med Sophia, for example, 45,000 migrants were rescued over a three-year period5. While limited from the outset, government efforts to rescue migrants at sea have become increasingly difficult with the rise of right wing and populist powers in Europe and the deficiencies (or perceived failure) of the European Asylum System brought to the fore by the steep increase in people seeking refuge in Europe in 2015 and 2016. One of the most contagious points is the Dublin Regulation, which (with a few restrictions) requires the state in which asylum seekers enter Europe to process their claim. In terms of migrants crossing the Mediterranean to Europe, this requirement places a particularly heavy burden on southern EU countries, especially, Italy, Greece and Spain6. In regard to the rescue of migrants at sea, the shift to the right and the rise of populist forces in Italy is of crucial importance, especially the success of the League and the Five Star Movement in the 2018 Italian election. With this change, the country that was once at the forefront of SAR operations has turned against it. For example, EUNAVOR Med Sophia has recently been extended but it now relies solely on air surveillance without the use of any vessels, due to protests from the Italian government. Even though Italy’s push for reforms of the European Asylum System is understandable, Italy’s stance still causes concern because it is frequently accompanied and embedded into xenophobic rhetoric. Matteo Salvini, the current Deputy Prime Minister of Italy, has, for example, described migrants as “an army of benefit thieves and criminals“. As Salvini‘s biographer Matteo Pucciarelli explains: “Up until a few years back, people were ashamed of saying certain things about migrants…. With Salvini there‘s total freedom. From a cultural perspective, he has opened the gates to very negative impulses that maybe were always around but weren‘t visible“7. This lack of ‘shame‘, is not only prevalent in Italy, but in many European countries due to the growing influence of right wing or populist forces. In this context, the discourse and practice of rescuing migrants at sea has become increasingly challenging. Indeed, many EU countries have searched for solutions that would, ideally, prevent migrants from reaching Europe in the first place. European countries have, for example, begun to fund and cooperate with the Libyan Coast Guard, which takes rescued migrants back to Libya. With Italian support, a Libyan Search and Rescue Zone was established, including the (ongoing) creation of a national Maritime Rescue Coordination Centre (MRCC) in Libya. The rescue zone reportedly extends around 80 nautical miles, covering about half the way to the Italian island of Lampedusa. In this area, where most migrants have been saved and that was previously largely covered by the Italian MRCC based in Rome, the Libyan authorities are now in charge of responding to distress signals and coordinating rescue missions. This is a concern for two reasons. First, the willingness of the Libyan Coast guard to assist people in need is disputed. Second, the return of migrants to Libya is highly controversial because the migrants are subsequently detained in dreadful conditions, characterized by a lack of food, mistreatment and torture8. Dissatisfied with government efforts to avert the humanitarian crisis in the Mediterranean, a small number of NGOs decided that active involvement was necessary to save lives at sea by conducting their own SAR operations. The Migrant Offshore Aid Station (MOAS), a Malta- based organization specifically created for this purpose, was the first organization to launch a vessel in the Mediterranean. Starting operations in August 2014, MOAS relied on a former fishing boat that had been converted into a SAR ship by the millionaires Christopher and Regina Catrambone and chartered to the organization for free. Around a dozen other NGOs followed their example. Among those were several other small, specialized groups such as Sea-Eye, Pro Activa Open Arms, SOS Mediterrane (SOS Med), Sea-Watch and Jugend Rettet. In addition, some large, well-known international organizations such as Medicines Sans Frontiere (MSF) and Save the Children also began to conduct rescue missions9. While the overall aim of NGOs is to rescue migrants from drowning, their modus operandi differs. Some of the smaller organizations do not take migrants on board their ships. They call for assistance, provide first aid, life vests and drinking water to those in need and monitor the situation until a larger vessel arrives to take the migrants to the mainland. Other organizations allow migrants in distress to board their vessels, where they receive necessary (medical) assistance and supplies and are taken to a European port. Initially, most migrants rescued in the Central Mediterranean were brought to Italy and disembarked there. A few organizations, including MOAS and Sea Watch were also able to use planes to support their SAR operations10. The NGO SAR operations have been funded by donations and have received public support, which was strengthened by positive media coverage of the NGO rescue missions, combined with reports of the human tragedies unfolding at sea. The NGOs also initially received praise from governments. Even more important was that governments regarded NGOs as legitimate (or at least acceptable) providers of SAR missions and cooperated with them. Without cooperation from authorities, especially the MRCC in Rome, but also other institutions such as EUNAVOR MED and Frontex, NGOs would not have been able to operate successfully. For example, NGO vessels often receive information about migrants in distress from government sources and they need government assistance to legally disembark rescued migrants in European ports11. Government collaboration is also necessary for NGOs to avoid prosecution as conflicting national and international regulations regarding SAR and illegal migration complicate the legal environment in which they operate. NGOs have therefore conducted “SAR operations only in coordination with and under the authorization of local Coast Guards”12. Over time, SAR operations conducted by NGOs have been increasingly criticised and their activities hampered. This shift can be attributed to the changing political environment in Europe, particularly the strengthening of right-wing and populist forces discussed above. It has been alleged that NGOs SAR operations are a ‘pull factor’, encouraging migrants to start their journey to Europe, even though recent studies have shown that this claim cannot be substantiated13. It has also been suggested that NGOs collaborate with people smugglers, or, at the very least facilitate their activities. It has, for instance, been voiced that people smugglers place migrants on unseaworthy vessels because they know that they will be rescued by NGOs. All these allegations have been denied by the NGOs involved14. Moreover, the power shift to the right has adversely affected the work of NGOs at sea and has forced many SAR NGOs to suspend their operations. The most important factor is that Italy, and several other states, have closed their ports to NGO rescue ships. NGOs can therefore no longer disembark migrants, refuel their vessels or get access to other necessary supplies. One prominent example is the crisis surrounding the Sea-Watch 3. On January 19, 2019, the crew rescued 47 migrants in the Mediterranean, but was denied access to European ports for nearly two weeks. As NGO rescue vessels are not equipped to cater for a large number of people for a prolonged period of time, the situation on board deteriorated and an application was lodged with the European Court of Human Rights to get assistance. Even though the court did not grant the applicants’ disembarkation request, it ordered the Italian government to provide adequate medical care, water, food and necessary supplies to the people on board. The migrants were eventually allowed to disembark in the port of Catania, after several European nations agreed to accept a share of the migrants. The vessel itself was detained in the port of Catania, as the Netherlands, the flag state of the Sea-Watch 3, investigates if the vessel is suitable to carry large numbers of people for a prolonged period of time15. Other NGOs were also forced to suspend their operations because their vessels have been detained by authorities and/or their crew threatened with charges of conducting illegal activities. For instance, the rescue vessel operated by Jugend Rettet has been seized by Italian authorities in August 2017. It is still detained and an investigation against crew members accused of collaboration with people smugglers and other criminal activities was launched16. 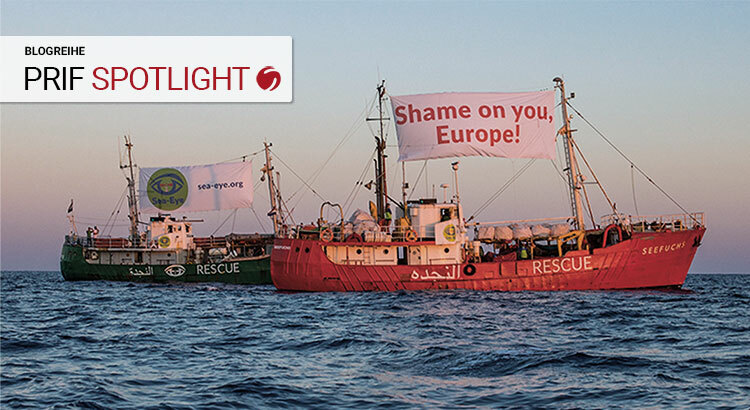 Furthermore, the difficulties created for those rescuing migrants did not only affect NGOs. Merchant vessels, which have played an important role in rescuing people at sea, have also faced restricted access to ports if they had rescued-migrants on board17. These difficulties have led to a reluctance of merchant ships to assist people in need, despite the obligation to rescue people in distress at sea manifested in UNCLOS and the SOLAS and SAR Conventions. Despite the ongoing humanitarian crisis, European SAR operations are currently further reduced. And because of the detention of rescue ships, law suits and the problems concerning the disembarkation of rescued migrants, fewer (and sometimes no) NGO SAR boats are active in the Mediterranean – with severe consequences and simply more deaths. Governments and policy makers urgently need to consider their options and address the problem. Letting people drown is inhumane, it is against international maritime law treaties, does not solve the current crisis, and will not stop migrants from attempting the dangerous crossing of the Mediterranean. The underlying drivers, such as (civil) war, human rights violations or poverty, force or prompt people to try to reach Europe – even if it is inherently dangerous. Addressing these root causes is therefore crucial, but will take considerable time. In the meantime it is important to address the humanitarian crisis in the Mediterranean. As a first step, it is imperative to ensure that sufficient SAR operations are conducted. European governments should substantially increase their own SAR efforts to assist those in need. At least, efforts need to be made by all EU countries to ensure that operations such as EUNAVOR Med Sophia continue and deploy vessels, which can rescue migrants. It is important that European naval authorities conduct SAR operations themselves rather than outsourcing these tasks to forces such as the Libyan Coast Guard, renowned for their disregard of human rights. If governments provide sufficient SAR services that take migrants to safe places, NGOs no longer need to ‘fill the gap’. Alternatively (or in addition), European governments should not hinder those that assist migrants in distress at sea, including merchant vessels and NGO ships. Governments should instead support and facilitate NGOs’ SAR missions and cooperate with these non-state actors. Cooperation between state authorities and SAR NGOs will lower the death toll at sea and save state resources. It also ensures that NGOs operate within existing laws and are accountable for their activities. The success of SAR missions hinges on the availability of disembarkation points for rescued migrants. The current situation is unacceptable, because decisions are made on a case-by-case basis and no clear rules and guidelines exist. What is required is a reliable regional disembarkation mechanism with identified disembarkation points in safe ports, as the UNHCR and IOM have repeatedly called for18. Clearly, the responsibility for the establishment of such a mechanism does not only lie with the European states where migrants arrive, but with all European countries. Indeed, all European countries need to share the burden and need to create a working system to distribute and relocate rescued migrants. A first step in that direction was the commitment of EU countries to a “more sustained collaborative, predictable and well-managed approach to dealing with all people rescued at sea”19 at the EU summit in June 2018. Now, action needs to follow this agreement. Download (pdf) Liss, Carolin (2019): Turning a blind eye? The rescue of migrants in the Mediterranean, PRIF Spotlight 3/2019, Frankfurt/M. Dr Carolin Liss is a Senior Researcher at PRIFs Research Department Transnational Actors where she is working on maritime security, piracy, Southeast Asian politics, natural resources, and the privatization of security. Local elections in Turkey: Can they steer the future of Turkish politics?